Ian McEwan is the author of two collections of stories and eleven previous novels, including Enduring Love, Amsterdam, for which he won the Booker Prize in 1998, Atonement and, most recently, On Chesil Beach. Michael Beard is a Nobel prize-winning physicist whose best work is behind him. Trading on his reputation, he speaks for enormous fees, lends his name to the letterheads of renowned scientific institutions and half-heartedly heads a government-backed initiative tackling global warming. A compulsive womaniser, Beard finds his fifth marriage floundering. But this time it is different: she is having the affair, and he is still in love with her. When Beard’s professional and personal worlds collide in a freak accident, an opportunity presents itself for Beard to extricate himself from his marital mess, reinvigorate his career and save the world from environmental disaster. 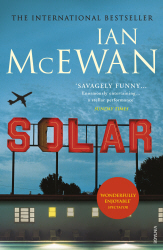 Ranging from the Arctic Circle to the deserts of New Mexico, SOLAR is a serious and darkly satirical novel, showing human frailty struggling with the most pressing and complex problem of our time.A story of one man’s greed and self-deception, it is a profound and stylish new work from one of the world’s great writers. An engrossing, satirical and very funny new novel on climate change A novel that promises comedy as well as crisis McEwan has already aired extracts … and the warmth, humour and zest of the book were unmistakable McEwan avoids the problem of how to dramatise and emotive area of science by uncharacteristically and highly effectively deploying a sly streak of comedy. Climate-change comedy that’s every bit as brilliant as its title suggests Solar has an engagingly direct, bleakly comic view of science and scientists. It also convinces.